Scrapbook Expo that I had to bring you a sample on the blog! and the 18th Century Proclamation stamp. 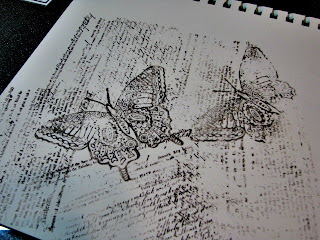 I stamped my paper with the Stampers big brush., I used watercolor paper. PITT Artist Pens in reds and yellows. 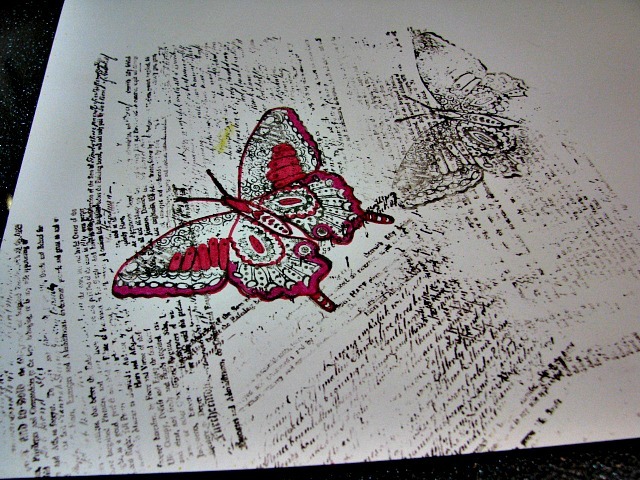 color all over the page with Gelatos ! You're so fine glitter-Diamond Clear Cool Highlight. Such a fun project! You should try this! Wow Rita! I got some gelatos while attending CKU Reunion but have not yet used them, this was an amazing technique. Lovely! It was great to meet you in person at scrapbook expo and see you play with the gelatos in person! 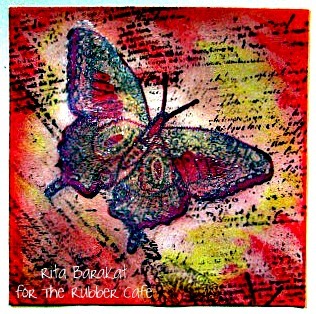 These stamps are awesome and I love what you created!! Thanks for sharing the how-to with us, Rita!! As soon as I get the products (glue etc)I just need to use this technique! Beautiful job! I keep hearing about those gelatos, need to check that product out!